Ruth Bader Ginsburg, associate justice of the United States Supreme Court, delivered Stanford’s 2017 Rathbun Lecture on a Meaningful Life in Memorial Church on Monday evening. 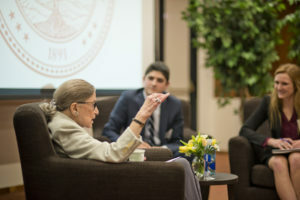 Ginsburg began the evening by reading excerpts from her 2016 autobiography, “My Own Words”, before engaging in conversation with Dean of Religious Life Jane Shaw. She addressed a wide range of topics, such as her career as a lawyer, her nearly six-decade marriage to taxation law expert Martin Ginsburg, the duty of the Supreme Court to offer legal clarity and uniformity as well as contemporary gender equity issues. Justice Ginsburg delivers the 2017 Rathbun Lecture (CHRIS DELGADO/The Stanford Daily). At Dean Shaw’s prompting, Ginsburg defined her own understanding of a meaningful life. Ginsburg also emphasized the collegiality among Supreme Court justices that is founded on their “reverence for the institution [they] serve,” despite differences in their views and approaches to Constitutional text. She specifically alluded to her friendship with the late Associate Justice Antonin Scalia, whose textualist and conservative approach stood in contrast with her progressive views. A later question from an audience member related her remarks on collegiality to issues of bipartisan gridlock present in contemporary American politics. Daniel Henry ’20 said he was struck by Ginsburg’s commitment to unity and collaboration in the Supreme Court in a time of political polarization. “I loved her quote, ‘Anger is a useless emotion.’ I feel as though in this particularly divisive political climate it’s particularly important to focus on her themes of collaboration and rational discourse,” said Henry. Students who attended the lecture said they were inspired by the presence and personality that came through in her speech. “Hearing her speak reminded me that for women to achieve we must be poised yet ballsy — caring yet rational — and, most importantly, incessantly, pedantically convinced that whatever we want to achieve can be done,” Alegria Ruseler-Smith ’20 said. As the first woman justice on the U.S. Supreme Court, O’Connor was both a professional and personal mentor. Both women battled cancer while juggling their duties as a justice, and O’Connor advised Ginsburg to focus on getting well instead of attending to get-well mail while recovering from colorectal cancer in 1999. Like Ginsburg, O’Connor served as a Rathbun Visiting Fellow in 2008. Other previous Fellows include His Holiness the 14th Dalai Lama, Children’s Defense Fund founder and president Marian Wright Edelman, as well as Oprah Winfrey, American actress, talk show host and philanthropist. The Harry and Emilia Rathbun Fund for Exploring What Leads to a Meaningful Life was established by the Foundation for Global Community in 2006 at Stanford and supports the Rathbun Lecture as well as other events at the Office for Religious Life. In response to a question about which values held by the Founding Fathers must change and which must remain, Ginsburg suggested that the electoral college should be eliminated while lauding the Freedom of the Press Clause and the Equal Protection Clause, which was implemented as part of the 14th Amendment in 1868. Contact Courtney Douglas at ccd4 ‘at’ stanford.edu and Miguel Samano at msamano ‘at’ stanford.edu.